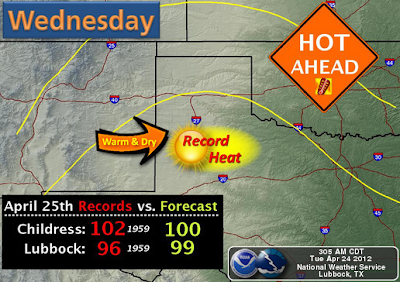 Near-Record To Record Heat Today & Wednesday. 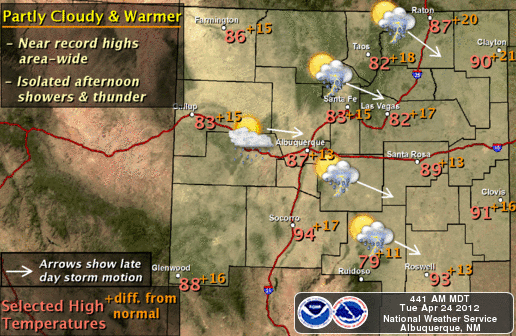 Map is Is Courtesy Of The Midland NWS Office. 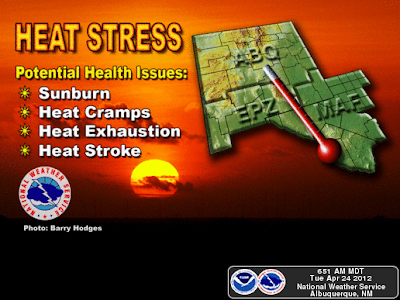 Hot temperatures return to the Pecos Valley as well as the rest of the local area today and more so tomorrow. A few locations will challenge their daily record high temperatures today with our afternoon highs forecast to be around 96. Tomorrow will be downright hot (considering its the end of April). 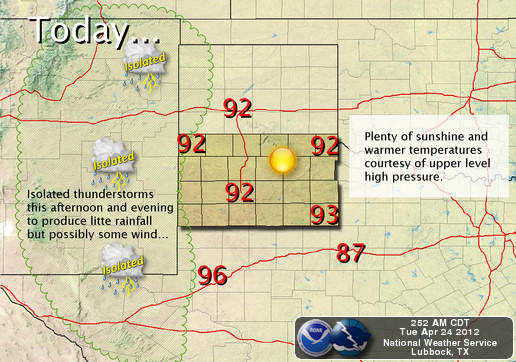 Our National Weather Service forecast high temperatures are generally in the 98-102 degree range. Not only will some of daily record high temperatures be challenged tomorrow, but some of our all-time April record highs may be tied or broken. 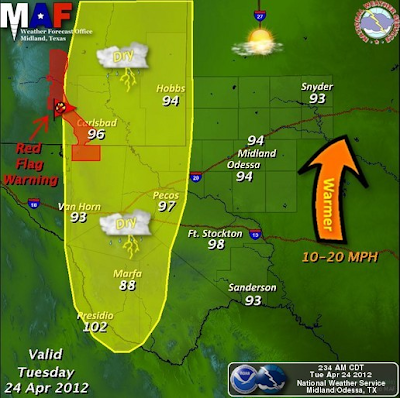 A Red Flag Warning is in effect for the Guadalupe Mountains as well as the eastern slopes of the Sacramento Mountains from noon until 7 PM MDT today. A Fire Weather Watch has been issued for the area for Thursday. Hot dry and windy weather is forecast on Thursday. Highs are forecast to range from the mid-upper 90's (a few spots may flirt with 100-degrees). Southwesterly-westerly winds are forecast to gust up to around 35 mph, perhaps higher in a few areas. 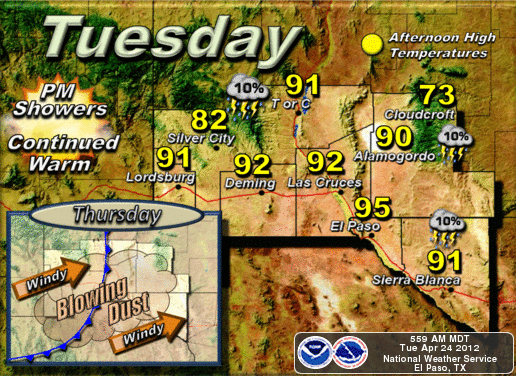 There may be areas of blowing dust develop Thursday afternoon. April's All-Time High 101 4-22-1965. 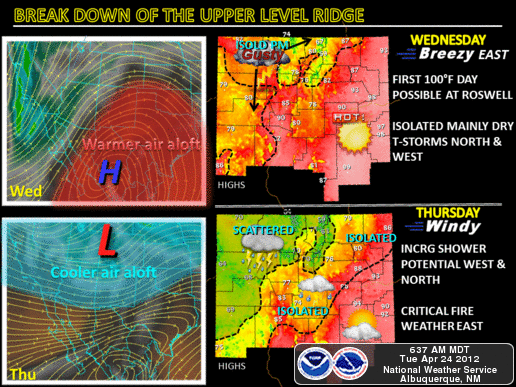 April's All-Time High 104 4-10-1934. April's All-Time High 100 4-18-1909, 4-16-1925, 4-22-1934, 4-24-1943. April's All-Time High 101 4-21-1965. April's All-Time High 98 4-18-1987, 4-21-1989. April's All-Time High 97 4-22-1965, 4-23-1989, 4-28-1996. April's All-Time High 85 4-21-1965, 4-22-1965. April's All-Time High 75 4-21-1989.